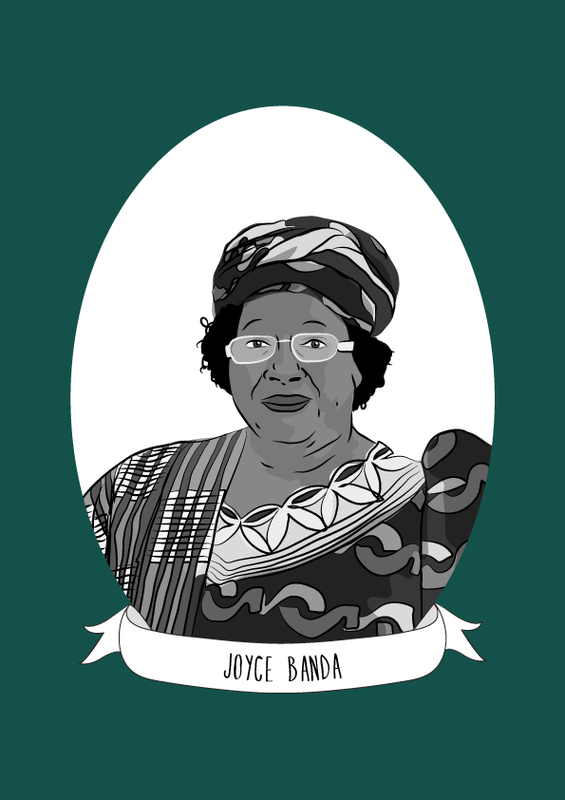 Joyce Banda is a Malawian politician who served as vice president (2009–12) and president (2012–14) of Malawi. She was the first woman to serve as head of state anywhere in Southern Africa. Banda was born in 1950 in Malemia, a village in the Zomba District of Nyasaland (now Malawi). After completing school, Banda went on to earn a Bachelor of Arts in Early Childhood Education, as well as a Bachelor of Social Studies specialising in Gender Studies and a Diploma in Management of NGOs from the International Labour Organization (ILO) Centre in Turin, Italy. By the age of 25, Banda has settled in Nairobi, Kenya with her first husband, Roy Kachale. She became involved with the growing women’s movement, which gave her the strength to leave her abusive husband with her three children. From 1985 – 1997, Banda was responsible for both managing and establishing a number of businesses and organisations including Ndekani Garments, Akajuwe Enterprises and Kalingidza Bakery. Banda’s success in business enabled her to help other women achieve financial independence so that they could break the cycle of abuse and poverty. She founded the the National Association of Business Women of Malawi, and the Joyce Banda Foundation, an organization dedicated to rural development and improving the lives of women and children in order to achieve this. In 1999, Banda entered politics and won a parliamentary seat as a member of President Bakili Muluzi’s United Democratic Front party, representing the Zomba Malosa constituency. Banda was named minister for Gender and Community Services, and she used her position to fight to enact the Domestic Violence Bill. She also created the National Platform for Action on Orphans and Vulnerable Children and the Zero Tolerance Campaign Against Child Abuse. In 2004, Banda was re-elected to the National Assembly and two years later, became the Minister of Foreign Affairs. Banda was committed to improving the situation in Malawi, and instituted austerity measures to try and combat the fact that Malawi was ranked as one of the world’s poorest countries and had experienced a deepening political crisis underscored by severe economic setbacks, including chronic fuel shortages and rising food prices. Banda cut her own salary by 30% as part of these measures, and sold the presidential jet and other vehicles to help pay off government debt. She also pledged to overturn the law that banned homosexual activities and eliminate government corruption. Banda was able to restore diplomatic ties with aid donors and increase the amount of funds coming into Malawi. In her fight against corruption, she sacked Malawi’s police chief Peter Mukhito, who had been accused of mishandling anti-government riots in 2011, in which at least 19 people were shot dead, and Patricia Kaliati as information minister. In 2013, following an assassination attempt on the Ministry of Finance official Paul Mphwiyo. He had been in charge of investigating government corruption, and this led to the Capital Hill Cashgate scandal. Civil servants, businessmen and politicians were put on trial accused of exploiting a loophole in the government’s payment system to divert millions into their own pockets. Banda dissolved her entire cabinet in order to carry out the investigation, so that cabinet officials would be unable to sabotage it. It was estimated that a total of $100-$250m of government funds were lost through corruption and fraud. In 2014, Banda ran for President and after accusations of voting irregularities and vote rigging, Banda called for the election to be re-held 90 days later. The Malawi High Court ruled that she did not have the power to annul the election, and although the Malawi Electoral Commission (MEC) requested to be given extra time to recount votes, this was denied and the results announced. Banda finished third, with Peter Mutharika becoming President. Banda is a member of a number of organisations, including the Global Leaders Council for Reproductive Health which aims to achieve universal access to reproductive health. She served as commissioner for “Bridging a World Divided” alongside UN Human Rights Commissioner Mary Robinson. She has also been a member of the Advisory Board for Education in Washington DC, and on the advisory board for the Federation of World Peace and Love in Taiwan (China). Banda herself has founded the young Women Leaders Network, National Association of Business Women and the Hunger Project in Malawi and continued her involvement with the Joyce Banda Foundation for Better Education. Banda was able to fund the building of the Joyce Banda foundation for children with prize money from winning the 1997 Africa Prize for Leadership for the Sustainable End of Hunger by the Hunger Project, a New York-based non-governmental organisation. She has also received a number of awards including: the International Award for the Health and Dignity of Women for her dedication to the rights of the women of Malawi by the Americans for United Nations Population Fund; the Martin Luther king Drum major Award, Legends Award for Leadership from the Greater A.M.E Church; Woman of Substance Award from the African Women Development Fund and the International award for entrepreneurship development, 1998, Africa Federation of Woman Entrepreneurs and Economic Commission for Africa (ECA). Sources here, here, here, here and here.